What you see is what you get with Apok…..and yet the Garrison still voted him in!! Always keen to lend a hand organising something or an ear to listen to a problem, Apok will help anyway he can. Coming up with crazy events or attending events that involve long walks are his forte. Just know at the end of any of these events this trooper will always be ready to have a beer or two and have a good old chat……seriously it is hard to shut him up. Rick was a Founding Member of the Redback Squad, and served as Squad Leader in 2008-9 during which time the Squad expanded at an amazing rate. Rick is well-liked and respected throughout both the Redbacks and the rest of Australia, and his experience makes him the natural choice for XO. Steve joined us, and claimed that he was shy. Luckily, Steve is very proactive in the Garrison and has become one of the cornerstones of our organisation. Steve has taken up the challenge of ensuring that the Redback Garrison’s costuming standards are second to none in Australia, whilst also keeping abreast of the many costuming requirements required for 501st membership. Craig is part of the team responsible for ensuring that the Redback Garrison’s costuming standards are second to none in Australia. Cutter has been a long time member of the 501st Legion, even after being dragged kicking and screaming to join by his wife. He takes great pleasure in performing as part of the Jedi Academy and Sith vs Jedi shows at our Dreamworld weekend each year and creating memorable moments for the children who participate. His uncanny ability to keep his head, when all others lose theirs is why his is perfect for the role of COG. Dan is a well-respected member of the 501st Legion. His even-handed and fair approach to issues is a great asset to the Redbacks. Andrew is part of the team responsible for managing our increasingly large donations to the numerous charities we support. Colleen is part of the team responsible for managing our increasingly large donations to the numerous charities we support. Beanie, a member since January 2007, had discovered Merchandise collecting from the Legion. Having spent many many hours (and $$$) trading world wide with other troopers, he begun to make merch himself, including T-shirts, Pins and Patches. He has an eye for detail, knows the value of collecting, designed many patches for the Redback’s and is always contacted by fellow members about a wide variety of merch. Aaron was born at a very early age and still remembers when the original Star Wars came out. Fueled by a passion for all things Sci-fi, he joined the Redbacks in late 2011 in order to legitimise his desire to dress up in plastic and spandex. In November of 2015, Aaron joined the Command Staff as a GEC, under the illusion that he would finally get the cookies he was promised. He has been told this will be “anytime now.” In February 2016, he accepted the position of GPRO, thinking he was actually being offered a free GoPro. He plans to use the GoPro to record getting his cookies. When he’s not pretending to be a guest on a late-night talk show, Aaron can be found lurking in dark corners of nerdy conventions… He still has not received any cookies… Or a GoPro. Sue is part of the team responsible for managing our social media profile and liaising with media. Moxxxie currently works as a Business Systems Analyst, but moonlights as both a Stormtrooper and a Web Developer in her spare time. She’s a long-term 501st Legion member and was the web administrator back when the Redback Garrison was merely the Redback Squad. She’s also served time on the Legion Web Team, and has developed our unique Events Tracking module to assist all our troopers in Event Management. This module is not only used by the Redback Garrison, but several other garrisons and groups around the world. Altair is an active and proud member of the Redback Garrison. He is always willing to lend a hand, especially with the administration of our website and forums. When Moxxxie discovered that he could speak binary she enlisted him to better serve the empire! Little does she know it wasn’t binary he spoke, he was just making weird noises as his mouth was full… of the cookies promised to Buzzard! Adam joined the Redback Garrison family in November 2012. Starting with a Sandtrooper, he then decided to take a “cooler” option also and become a Snowtrooper. This master “Photobomber” Snowtrooper is known for making frequent trips down the coast to Brisbane and surrounds from his home region of Hervey Bay. In 2015, he became a Garrison Event Co-ordinator, assisting Bullant in the role. This was a proud moment in his 501st life, only recently topped by being appointed as the Squad Leader of the Redback Garrison’s new “Razorbacks Squad”. Keep an eye out in your photo’s, you never know when he will pop up. 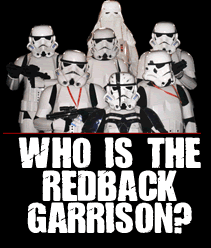 Reanae is part of the team responsible for organising events that involve the Redback Garrison. Mark joined the Redback Garrison in August 2012 as a Classic ANH Storm Trooper but soon found that being a minion of pew pew worship was his calling and soon was approved as an Imperial Gunner. Becoming the Garrison Armorer was a natural progression with repairs to Garrison members weapons, development of new weapons and hoarding of various BFG’s. Volunteering as the Garrison Event Manager for many SupaNova’s and assisting in the development of new GEMS and assistants GEMS has been a highlight as was catching out Baytrooper at the recent Pink Stumps Day.